The Moon comes in three different builds, all with aluminum frames. This top of the line Moon 3.0, as tested, has a Fox Factory 36 fork, Factory DPX2 shock, WTB's Asym i29 wheels, a SRAM X01 drivetrain with Guide RS brakes, a Fox Transfer post, and RaceFace Affect bar and stem. Currently, the Moon is only available in Europe and Latin America, leaving the rest of the world a bit in the dark. Construction and Features The Moon is built on Kross's RVS suspension platform and has many of the same features as their Soil trail bike. According to Kross's Product manager, Jan Sweich, the updates to the Moon, like the lower bottom bracket height and longer wheelbase, were intended to lower the center of gravity and add stability at higher speeds.The components reflect the bike's intended use. WTB wheels with a 29mm internal width for higher volume tires, dropper post, and capable brakes along with internal cable routing throughout give the bike an aggressive and clean stance. The rear brake is mounted to the frame on a standard post mount, but the hardware threads into replaceable inserts, an idea not seen often that offers a lot of practicality should one strip the threads out.Noticeably missing on the Moon are the two bolts needed to mount a bottle cage. The suspension design of the bike seems to eliminate this as an option, which is unfortunate. Geometry & Sizing The Moon's 65-degree headtube angle is slack and appropriate for the bike's intended use, and the effective seat tube angle on the medium sized bike is 75.42º. The reach of 436mm for the medium size is pretty standard, as are the chainstays at 430mm. It's worth noting that the seat tube height is on the longer side, which could make it difficult for riders to run a longer travel dropper post depending on their height. Climbing The Moon impressed me with how well it sat up in its travel, and although your hips are sitting fairly far back over the rear axle, the shock doesn't sink too deep into its stroke, which makes the bike quite comfortable on the ups. There's plenty of traction, and it doesn't feel overly hefty, despite what the scale reads. It's not the bike I would make my first choice for an all-day technical singletrack mission, but for getting up fire roads and bombing down some rough trail, it's great. On steeper and more technical climbs, the bike will motor through just about anything in a straight line as long as you maintain power to the pedals. However, when you're picking your way around tighter and techier bits of trail, the front end will want to walk a little side to side - something the more forward and centralized position of a steeper seat angle could potentially help abate.I've been spending a lot of time on Yeti's new SB130 and have really been appreciating its steeper 77-degree seat angle - a bit of a contrast to this bike. Both are efficient enough to not really need the pedaling platform switch on the shock, but I felt like it was easier to keep weight on the front wheel aboard the Yeti. Descending The fit of the size medium I was on was excellent, and I felt comfortable and neutral while descending. The Moon's reach of 436mm isn't boundary pushing, but I felt right at home, and I didn't feel the need to change stems or move things around far away from the standard set-up.I didn't have any trouble getting the bike from one side of the trail to the other or snapping it around trail debris, and when it came time to plow through rough and harsh sections of trail the bike stayed planted and manageable. It remained very controlled and surefooted on sections of trail that have been a little nerve-wracking on other bikes. Kross didn't go too extreme with the Moon's geometry numbers, but that's likely a large part of the reason if felt familiar and easy to handle. 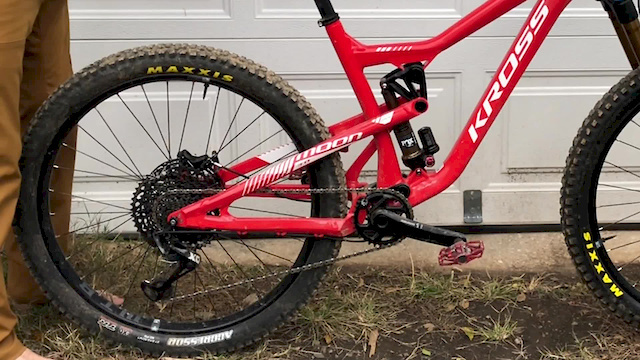 The head angle is slack, but not DH-bike slack, and the chainstays are relatively short, which helped keep it maneuverable on tighter trails. When the need to get the bike up and over something arises, it's not a huge chore to put get it into the air. Even while hucking into the abyss of rooty and rock-filled trenches that I typically thread through on shorter travel bikes, the Moon easily soaked up the hits. The bike ramps up well at the end of the travel, and it makes full use out of the suspension without harshly bottoming out. Heavier riders may want to drop an extra volume reducer in the can to increase that ramp up by a touch, but for me, it was just about right. How does it compare? The Santa Cruz Bronson has 10mm less travel than the Moon on the back end, but the geometry numbers are really darn close to each other, and both bikes have a similar intended use and feel on the trail, especially while descending.The Moon, like the Bronson, is a capable climber. It's a little more "loungy", and you do sink into the travel a touch more than on the Bronson, but there's a similar feeling of efficiency. Both bikes are forgiving and supple in chunky terrain. The Moon does have a little more give to it with that extra 10mm of travel when plowing through rough stuff, but it's barely enough to discern, and I doubt you could tell much of a difference if you rode both bikes down the same trail back to back.Both bikes do a good job of muting small bumps and chatter - the Moon is a bit softer in the initial and mid part of the shock stroke than the Bronson, but both bikes are undoubtedly a "heels down flat out" kind of ride.Another difference between these two bikes is the frame material and spec options. The Bronson has four different aluminum build choices and a whopping ten different builds with carbon that you could choose from; it's also available as a 'frame only' in both carbon and aluminum. The Moon has three build options and all of the frames are aluminum. When you put the bikes next to each other, looking at where they line up for the price, we have to compare Santa Cruz's aluminum Bronson S+. This is the nicest build one can get before going into carbon. It's slightly less spendy than the Moon, but has less high tier components. This puts the Moon a bit above the Bronson in the element of builds, however, the Bronson has a water bottle mount on the downtube - something that the Moon misses the mark on. Is this the bike for you? The Moon is an enduro bike that's race ready with very few changes right out of the box. It offers a different suspension design than many others out there and has an appearance that is sure to turn heads. It does a good enough job of climbing, there's more small bump compliance than many other bikes in its class, and it descends incredibly well. If you can get past not being able to stick a bottle on the downtube, it's one of the more well-rounded enduro bikes out there and a really good design.